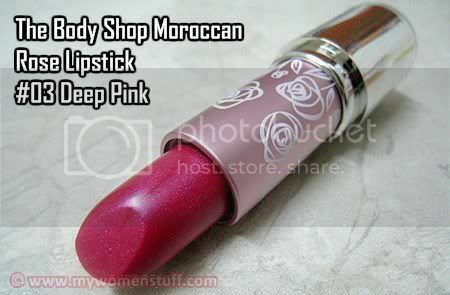 The only item that really captured my imagination from The Body Shop Moroccan Rose collection was the lipsticks. They were very emollient and applied very smoothly. What’s pretty about the Moroccan Rose lipsticks is the packaging. Although the cover is a cheap looking transparent plastic, the body with its metallic pink tube and white print flowers looks very feminine and pretty. Contrary to my earlier opinion, there is a slight rose scent to the lipsticks. I guess the tester had been left open so the smell had dissipated. In terms of colour, as I have stated, the colour is a deep rose-pink that borders on fuschia. The sales person at The Body Shop tried her darnest to dissuade me from getting it, persuading me that #2 True Pink was more popular and more suitable for Asian skintones. Much as I liked True Rose, its been a while since I wore a bright pink lipstick so I decided to rebel. 😛 That said, Deep Pink is a colour that might suit those with darker skintones or very light skintones best. And better still if you handle cool tones well. Also, you’ll have to like bright lipstick because this one’s bright! I happen to like the colour somewhat. I like bright colours and the colour looked pretty decent on me. 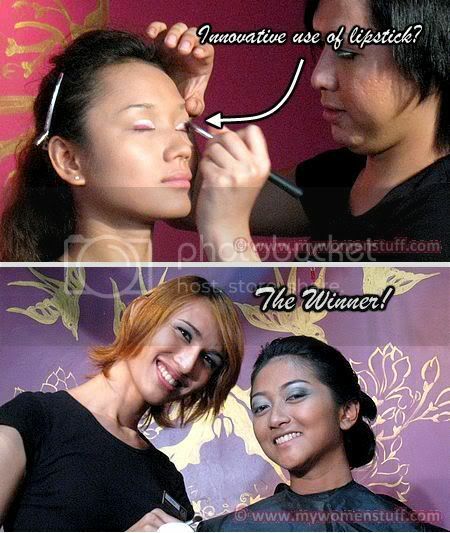 I attended the makeup finals by The Body Shop makeup artists featuring the Moroccan Rose collection as a guest. Beetrice has given it good coverage so I won’t repeat it. I saw one of the makeup artists using a lipstick (possibly Deep Pink!) on one of the model’s eyelids and then blending like crazy to a soft pink. It was quite an innovative use of product I thought. She did not win however. A bigger venue might be better to accommodate the number of invitees. The enclosed venue with its burning candles, flowers and crowds could pose a fire hazard. Door gifts whilst appreciated should not contain press gifts from 2-3 years ago. Especially not when it is cream based products. Also if invitees are allowed to bring guests and they do, don’t discriminate against guys. The Body Shop has a men’s range – samples of products will go a long way towards making the men happy and might even net a new customer! Merely handing them a copy of Cosmopolitan (Malaysia) magazine when girls get a little bag of goodies is not acceptable in my book. Guests of invitees should be allowed to vote for the winners. It doesn’t make sense otherwise to have the crowd but only a few voters. Please when announcing winners, refer to them by name not a number. If I were a winner, I’d like to be called by my name too. Especially if I was a makeup artist in a store – it’ll encourage people to ask for me by name. They can’t go to a Body Shop store and ask for #5 can they? NEXT POST: Will you save on your skincare? I hope your thoughts on the event will be read by events organizers! I can’t agree with you more! Thanks and yeah I hope someone reads this! They do need to improve but then not everyone’s as picky I guess. Yar, I read Beetrice’s review on the event and I was a bit peeved even though I wasn’t there. I mean, you’re owned by LOREAL, a huge conglomerate who owns practically every damn makeup brand there is in the world, can’t you afford to be a little bit less cheapy in a major event? TBS does have some pretty good stuff but a lot of times, they are so overrated. If any TBS folks are reading this, I hope they take note for the next event. I have to agree with the bit about L’oreal. It certainly did not live up to the standards we were expecting. I love these three lipsticks of the collection and bought them all. it’s so nice that you are enjoying your holidays!! i’m just rushing my assignments and worrying about all my tests/reports/thesis…..
i guess you are somewhere at the hill or island? Yes, I got the Lancome Blanc Expert free samples at Parkson Pavilion this morning. Thanks so much for the voucher Paris! Planning to get the other 2 colours! Let me guess?? You are in Beijing/ Shanghai? Or Hong Kong? Taking advantage of the Singapore Airlines offer, is it? i have the one in soft pink. true pink looks uber yummy though 🙁 i do agree that deep pink looks pretty scary! esp when TBS model wears it. That is a beautiful shade and it looks so pretty on you! Thank you, it is really pretty in the tube albeit a little scary pink. Yep yep! I was quite happy to rebel 😛 Thank you!